President Shimon Peres visited the Gaza vicinity Wednesday, after heavy rocket fire hit the area last week and an anti-tank missile hit a school bus, critically injuring a teenage boy. Peres met with the school bus-driver, Zion Yemini, who recounted the horrible incident. He said that immediately after he heard a loud blast, his first thought had been of how to save the boy. "I really love him, and I couldn't understand how it was that I couldn't grab him and throw him clear of the bus," Yemini said. "The president's visit and the fact that the people of Israel are behind him will help him to recover." Peres was scheduled to visit Nahal Oz, but residents were disappointed to learn he would not be arriving due to security issues. The president explained that the visit was not cancelled due to fear for his life, "but rather the lives of others". Anat Maoz, a resident of the kibbutz whose son was on the bus just moments before it was hit, made no effort to hide her criticism. "You couldn't make it, but our children once again took the road hit by the anti-tank missile," she said. "There was anticipation and organization, everyone wanted to meet the president. It was supposed to be a visit of encouragement but now the opposite is true." Peres toured Kibbutz Erez together with GOC Southern Command Tal Russo and Shaar Hanegev Regional Council Chairman Alon Schuster. "Such unification of hearts, soldiers, government, and civilians is one of Israel's finest hours," he said. The president also praised the Iron Dome defence system, which intercepted rockets fired from Gaza at Ashkelon and Beersheba. "I will not hide my pride at the fact that Israel is the only one to have found an answer to missiles, and this is the first place to have such a technological breakthrough," he said. At the kibbutz, Peres also visited a kindergarten and sang Passover songs with the children there. "I've come here in the name of all the children of Israel to wish you a happy Passover Eve, a happy holiday of liberation," he told the kids. "You are the true heroes of Israel. You are brave and wise and when I) listen to you I leave here optimistic and cheered." The president was visibly moved when 5-year old Ariel raised his hand and asked whether it was possible to return kidnapped soldier Gilad Shalit home for Passover. 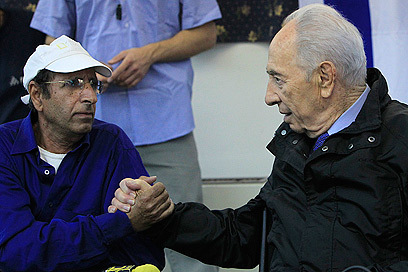 "The entire people of Israel wishes together with you that for the holiday of freedom Gilad Shalit, the son of all of us, will return healthy to his family, and to Israel," Peres answered. During the tour Major-General Russo analyzed the tense calm that has pervaded the south since the attack on the school bus Thursday. "This incident was serious and began the final round, as our goal is that the residents of the south live normal lives. We did not engage in full power, but operated with collaboration between forces in the air, sea, and ground and hurt Hamas severely," he said. "In the end the tail wags the dog. The political leadership wants a lull while the military tries to harm civilians. The gap between the two is immense," Russo said, adding that the IDF was "prepared for any contingency". See all talkbacks "Peres meets wounded school bus driver"